Alcoves are large hollows in the sandstone cliffs. Native Americans utilized many of the deepest for protected living quarters and food storage. Although alcoves are not true caves they usually form where water seeps out of the sandstone along a horizontal line that follows a bedding plane. The water dissolves the cementing agent (often calcium carbonate or iron oxide) that holds the sand grains together to create a horizontal recess in the cliff face. Over time the recess grows deeper as the dissolution continues as slabs fall and from the ceiling of the opening. The slabs break into thousands of fragments that are also attacked by the seep waters, winds and rain. Over thousands of years the shape the alcove often assumes the lines of an arch that can support its ceiling more effectively than flat-ceilinged recesses. Natural Bridges form where streams undercut adjacent cliffs until they break through to downstream meanders or, sometimes, the course of a tributary stream. The most famous natural bridge is Rainbow Bridge (photo above) where Bridge Creek battered its way through a fin of sandstone about 30,000 years ago. Since the breakthrough occurred the opening has grown larger (sheets of rock falling from the underside of the bridge) while the stream has continued to cut downwards. Today Rainbow Bridge spans 278 feet and is 290 feet high. 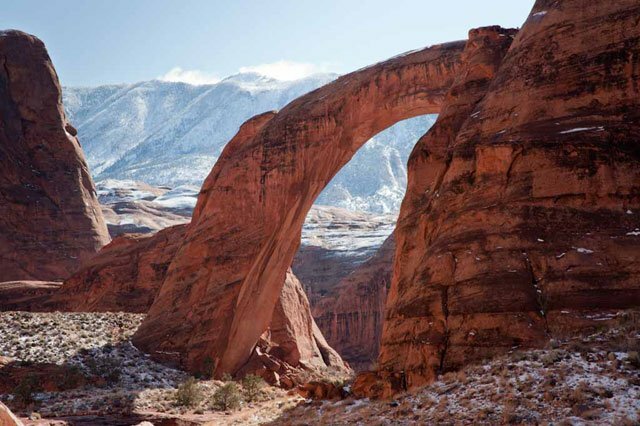 Arches, like natural bridges, are windows in solid rock but they were not cut by streams and do not therefore span waterways. It’s just the weathering of the rock that creates the arch. Arches most often form where weaknesses exist in the rock sequence such as along some bedding planes or cracks and joints in the rock. Gravity often plays an important part in the removal of the weathered rock and the enlargement of the arch. Slot Canyons are numerous and famous in the Lake Powell area. The Navajo Sandstone is the most common host for slot canyons but the Entrada Sandstone and Wingate can also make excellent slot canyon locations. All three of these, of course, are sandstones deposited as sand dunes. The ancient dune material is just hard enough to form vertical and overhanging cliffs and yet soft enough to be eroded quickly by grit- and cobble-carrying flood waters. Many slot canyons, most famously like Antelope Canyon, were created when a section of the original wide canyon was blocked either by a rockfall or encroaching sand dunes during a lengthy drought. Eventually, when the drought ends, a lake forms upstream of the blockage. It grows deeper until it finally overtops the “dam.” However, the breaching location will probably not lie immediately above the original canyon. Therefore a new canyon is carved through the blockage into fresh bedrock. Because the torrent of water cutting through the obstacle is steep (coming from the top of the lake) and because it is loaded with sand (carried by the floodwaters) the down-cutting proceeds with exceptional speed. Canyon widening, however, has little chance to go to work. It takes time to widen a canyon. The result is an exceedingly narrow and sinuous canyon that expresses the speed of the down-cutting, the relative leisureliness of widening processes, and the twisting shapes of the tumbling tongues of water doing the carving. Pedestal Rocks (sometimes called balanced rocks) form where harder rock layers sit upon significantly softer rock layers. There are many such rock layer boundaries in the Glen Canyon area, many of them with erosion-resistant layers resting on softer rocks. When conditions (the local rate of erosion, the climate, the presence or absence of fractures in the rock, the difference in erosion resistance of the two rock layers) are just right then pedestal rocks will develop. In the Glen Canyon area it is where the Shinarump Conglomerate rests upon the Moenkopi Formation and where the Dakota Sandstone rests upon the Entrada Sandstone that some of the most spectacular pedestal rocks develops. Gary Ladd, renowned Southwest photographer and author of numerous books including "Page, Arizona: Hub of the Visual Universe" (available only through Gary's website), Glen Canyon: Images of a Lost World, Grand Canyon: Time Below the Rim, and Lake Powell: A Photographic Essay of Glen Canyon National Recreation Area. Gary Ladd's photography and autographed books are available through his website, Laddscapes: Gary Ladd Photography.